The Donjon des Aigles is a worldwide known attraction. 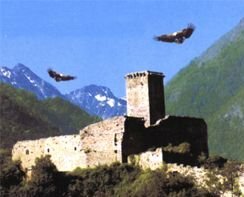 A historical site: the Donjon des Aigles used to be a feudal fort of the 11th century, in a wonderful location, from where you can contemplate the beautiful panorama on the valley and on the chain of the Pyrenees. There you will find an original presentation of the most prestigious collection of prey birds in the entire world (more than 45 species). And most of all, a unique show every afternoon, with music, and filled with emotions. At the Donjon des Aigles, situated only 15 km away from Lourdes, near Argelès-Gazost, you can admire Egyptian vultures breaking eggs, bearded vultures and many other birds of prey species. You can read and learn from the cards available at each visit. The Donjon des Aigles is open each afternoon from spring to September. Shows at 3:30pm and 5pm, and in August, at 3pm, 4:30pm and 6pm.